BMW used Snapchat's “augmented trial” lens, left, to show off the X2. LAS VEGAS — Vehicle subscription services have been touted as an alternative for consumers who'd rather have a buffet of options instead of being locked down to one vehicle. But Hyundai marketing chief Dean Evans said most consumers don't need that much choice. And if they find themselves in a spot where they need a vehicle with a little more versatility, Evans said, they can simply rent an SUV for the weekend. "You can't financially make it work," Evans said of subscriptions, during a discussion with media at the J.D. Power Automotive Marketing Roundtable last week. "You can try with luxury, like Cadillac and Audi are doing. Sure, at $1,500, you can do it," he said, but "you can't do it for mainstream and have a $399, $499, $599 or even $699 [subscription fee]. You just can't make it pencil. We don't want to start paying to give cars away." Hyundai deployed chat bots to engage Kona, Veloster and Santa Fe shoppers in online conversations before those vehicles hit dealerships this year. The bots were housed in special landing pages on Hyundai's website. A bot for the Veloster N, which is expected to arrive before the end of the year, is still active. The automaker learned that the bots, which were programmed to provide users with information on features and help them set up test drives, were able to understand user input and provide a relevant response 92.9 percent of the time. In addition, 27.7 percent of users clicked "tell me more" when the bot offered the option. The bots don't just figure out answers to questions, they also learn on the go. "The bot will analyze its own interactions, how successful it was at answering a user's question and it'll apply that to the next user interaction," said Patrick Leber, senior digital manager for Innocean, Hyundai's ad agency. "Consumers are getting more used to landing on a page and then saying, 'I'm looking for this, can you help me?' " he said. "It's a more guided experience." 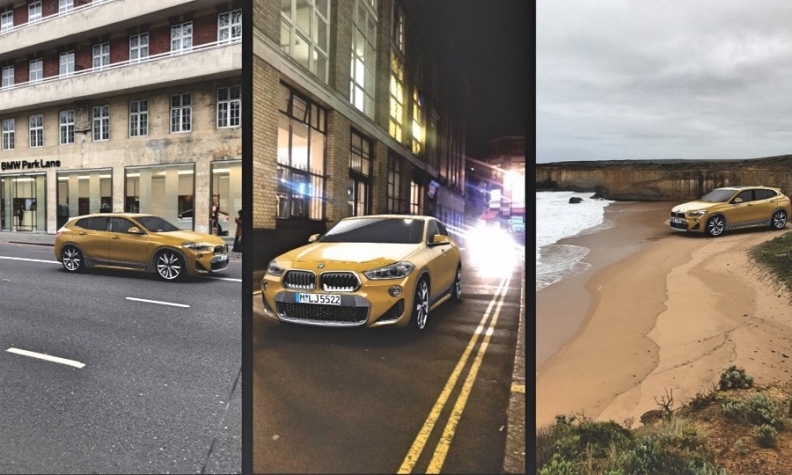 While Snapchat is conducive to ads that tell stories within a few seconds, BMW leveraged the platform last fall to provide an immersive experience with the X2 crossover that reached users across the world. BMW was the first brand to use Snapchat's "augmented trial lens," which placed a 3D version of the X2 in front of users when they peered through their phones. Users could do a virtual walkaround, change the color and get an up-close look before it hit showrooms. "Think about how much more engaging this is than going to a website like bmw.com," said Jeff Miller, Snapchat's global head of creative strategy. "You're getting an experience that is showing intent and giving the opportunity to learn more." Miller said Ford Canada also used Snapchat's augmented reality tool to highlight the EcoSport. In addition to the virtual walkaround, Ford gave users the ability to enter the car and view its interior. The number of brands that consumers consider doesn't get smaller as their shopping journeys progress, according to the Nielsen Auto Marketing Report. The company, known for its TV ratings system, reports that at the one- to two-year mark before a purchase, people have two to three brands under consideration. That number then grows to five brands when a consumer is ready to buy, with millennials more likely than other groups to add to their consideration list. Nielsen said the finding is important because it shows that potential buyers are open to considering more brands despite having a "top of mind" option. Nielsen also reminded marketers of the power of old media, such as direct mail. "You can personalize it, it shows up to your house ... it just sits there," said Ameneh Atai, Nielsen's senior vice president of business development. "If you're looking to buy a car, you'll look at it and you'll remember it." Video is no longer just a branding tool, said Kelly McNearney, Google's senior automotive retail strategist. In the final weeks before purchase, McNearney said, shoppers are watching vehicle walkarounds, comparisons and feature-focused videos to narrow down their choices. Google research has found that 88 percent of video watchers knew what they were buying when they visited a dealership, compared with 78 percent for those who didn't watch a video. "Even two weeks before purchase, they're watching five different YouTube videos trying to make the decision," McNearney said. "These aren't ads. These are people seeking automotive content on YouTube to help make their ultimate decisions." Only around 2.3 percent of car shoppers have Kia on their consideration lists when they're six months out from making a purchase. That presents a challenge for Kia marketers and their limited ad budget. So Kia is working with Google to determine which search keywords dealers should focus on for their marketing efforts. This ensures that Kia and its dealers don't waste money going after the same search terms. Kia dealers have performed well on searches when shoppers are trying to figure out where to buy. "We're not tripping over each other's toes," said John Schurger, national manager of retail marketing at Kia Motors America, "and we're doing a better job of covering all potential keywords that we can within the confines of our budget."